We are often told that to find a career you love, you need to follow your passion in life. Bachelor of Agriculture student Georga Brennan is taking this one step further and combining her two passions - horses and agriculture, to set herself up for an exciting future career. Growing up, Georga always loved horses and was exposed to the equestrian industry from a very young age. This love grew even more as she got older and since then has led to some pretty exciting moments. One stand out moment for Georga was when she got to travel to Europe for the Rio Olympics, as part of the Australian preparation team. 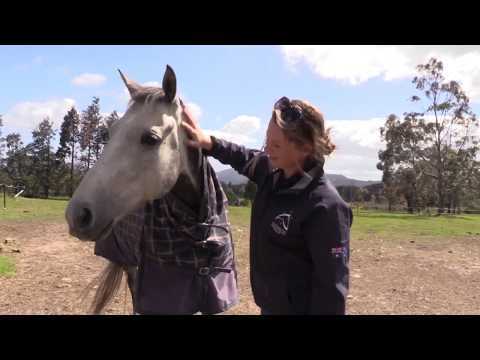 Georga was the groom for Australian equestrian rider, and Olympic medallist, Sonja Johnson. This involved looking after the horses, including feeding, saddling and daily maintainance. "I was able to travel around Europe and go to some of the competitions that I had previously dreamed about seeing. "Possibly the best part of the whole trip was being surrounded by the world's best eventers. I was able to watch, meet, socialise and learn from the best. It was an experience that I was very lucky to be a part of and I came away with knowledge and friends that I will have for a lifetime. I hope that one day, that could also be me going to the Olympics with my horses, and I think that agriculture and the equestrian industry link together very well. While, Georga’s love of horses was embedded from a young age, her passion for agriculture came a little later in life. After she finished college, Georga moved to Western Australia to work with Sonja Johnson, on her property in Albany. “I moved to WA for two years. Working with Sonja I was exposed to not only horses, but tonnes of sheep. I found out that I loved wool and I loved being involved in the agriculture industry. When I was at school I had really no idea about what agriculture really was. I thought I was just farming, and then going off and being on a sheep farm for two years really opened my eyes to what is on offer and there is one massive world out there that we need to feed. After her passion for agriculture was sparked, Georga looked into the agriculture courses offered across Australia, before ultimately choosing the University of Tasmania. “I had a look all around Australia at the different options for studying agriculture. The University of Tasmania has a great reputation, and I thought that being at home and having a high quality education was the best option for me. Georga is now in the third year of the Bachelor of Agriculture and say she has really enjoyed the university experience. She is confident that she is building her knowledge in crop and pasture production, animal nutrition, soils, and sustainable land management, all which will be extremely valuable for her career in agriculture and also in her pursuit to continue her dream of riding at the highest level. I find that the best part of being a student and studying agriculture is the people that you meet, and the friends that you gain. “The field trips and everything you study gives you a wide range of knowledge. We are exposed to a whole range of different industries. “I am pretty excited to be in my last year of study at UTAS. I am also pretty excited about heading off into the industry once I’ve finished. The School of Land and Food at the University of Tasmania offers two undergraduate bachelor degrees in agriculture. A four-year Bachelor of Agricultural Science or a three-year Bachelor of Applied Science (Agriculture and Business).